Your car's battery is one of the more critical components of your car. Without it, your vehicle won't start, and critical automotive systems will fail to function. Keeping it clean is very important if you want to keep your car performing reliably. Even the best used SUV can develop corrosion on its battery terminals. Even when everything is functioning properly, you may still see the development of corrosion on terminals. However, there are some causes that may indicate your ignition system needs some attention. 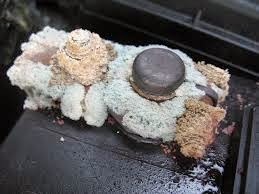 One of the chief causes of battery terminal corrosion is the corrosion itself. Battery terminal corrosion creates high resistance on the positive (red) battery terminal. This means that once corrosion has started forming, its formation will continue to make the problem worse. To address it, you should include the cleaning of the battery terminals at regular intervals. If periodic cleaning doesn't do much for the condition of your battery terminals, it may be time to look at the battery itself. All batteries will eventually develop leaks, but older batteries are more susceptible. Chemicals within the battery are highly reactive with the lead contained in battery posts. If the best used SUV has an older battery, the chances that a simple chemical leak is causing the problem are pretty good. Another possible cause of battery terminal corrosion could be the over-charging of the battery. If you suspect overcharging may in fact be the cause, it is best to have a professional check it out first before pursuing a fix. If your car, truck, or SUV is having battery terminal corrosion issues, don't wait for a dead battery to stop you in your tracks. Have your mechanic check your system for any major problems, and add cleaning of your battery poles to your preventative maintenance checklist.